$149.99 & FREE Shipping on orders over $59. The ultimate pump for home winemaking use. Self-priming (will push air) so that it can draw out of a tank. Gentle diaphram action so as to not "beat up" the wine. Made of food-grade, NSF approved, materials polypropylene and santoprene, so no metallic interaction with wine. Pumps 3 gallons per minute. Flow can be restricted with an inline valve positioned on the outflow side. Self-regulating motor is designed to temporarily shut down, and then turn back on, when restriction pressure exceeds pump capacity. Has a heat limitation of 125 degrees Fahrenheit so cannot be used in brewing applications. 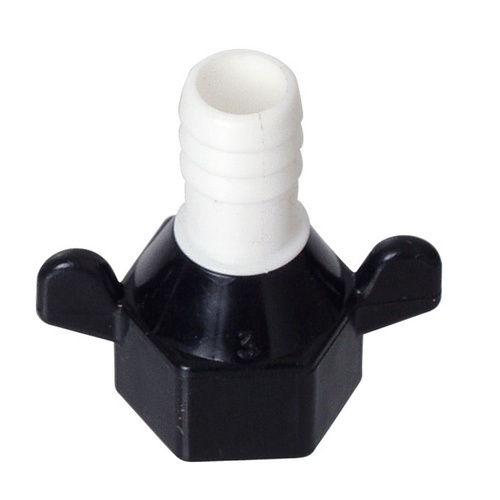 Pump is equipped with 1/2" Male NPT posts on the inlet and outlet. Does not include the plastic barb fittings you will need to purchase separately. Please see the "You Might Also Need" section below for our recommendations regarding which fittings to attach to the pump. Please Note: The diaphragms in this pump are very sensitive to sediment and particulates and can be damaged if any solids are taken into the pump head. We recommend using an Inline Pre-Filter (FIL26) if you think there's a risk of sucking up solids with your inlet hose (pumping during pressing, for instance). LIQUID TEMPERATURE: 130 Degrees Fahrenheit (54 Degrees Centigrade) Max. too lazy to pick up my beer. this looks like i can stick a hose in the carboy and pump it directly into my gut. This was literally the only self priming food grade pump I could find. I ended up purchasing two so I could transfer 275 gallons in 45 minutes. Because I wanted the item. Used this to pump wine from the cellar up to a bottling rack and it worked great and was a lot quieter than our old pump. Great pump. Quiet and efficient. Twice as fast as my old pump and needed no priming! Great pump! Well worth the price! self priming. powerful enough to drain a 20 gallon tank in about 9 minutes. rubber grommets on the bottom allow you to screw it to a wood or metal stand and not have the unit vibrate or make vibration noises as it rubs on the stand during use. it is a small and compact size with a power cord that is long enough (there is no on-off switch, but you could build one in with some basic electrical techniques and supplies. I've been using a Shurflo Diaphragm Pump for 4+ years and I'm very pleased with it. If you believe that diaphragm pumping is "easier" on the wine than centrifugal action pumping, this is a very economical diaphragm pump for home winemakers, or a small winery, to use for racking or transferring wine. Using the in-line filter is a must. The suction lift and pumping pressure are very good. Used properly, this is pretty much a maintenance free pump. I just purchased a second Shurflo to multi-task and have a back-up pump. A reasonable pump for low volume (750 L) racking. Not good for moving free wine from the fermenter even with a screen filter on the suction side of the pump. I’m on my second pump. The diaphragm went bad after 4 years. Would be nice to be able to replace the pump only at a reasonable price. Great Pump for the price. Quiet, fast for it's size. Great service and advice from MoreWine. Works great. Plug it into an outlet on a switch because it comes on automatically when hooked up to power. If you want you can get a resistor to change the speed but I've found that it foams very little, even less than my old diaphragm pump I got from this site with variable speed option, and it doesn't electrocute me like the other one does either! I see there are lots of positive reviews for this pump, but I have not had the same positive experience using this pump. I have had this pump for almost 6 years now and am just now getting to giving it a review. Here is what I liked and what I didn't. 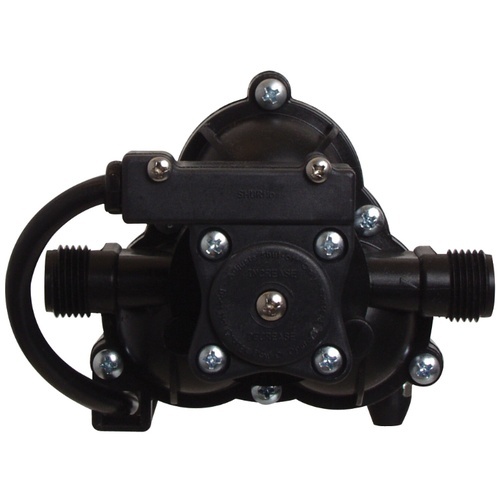 - Diaphragm pump makes it very very very difficult to control the flow of liquid. I use a ball valve on the outlet and you really cant throttle this pump lower than about 15%-20% from maximum. If you do the pump shuts off. It has a pressure sensor that cuts out at a certain restriction value. - Churns the liquid - The diaphragm cause a pulsing action in the liquid. Foams the beer instantly. Maybe I just got a bad pump. Who knows, but for me this pump has been nothing but headaches. I decided to take a part the pumping head to see if there was anything causing the issues I was having using the pump. To my surprise, one of the diaphragms was clogged with what looks like hop leaves. I cleaned the pump head, put everything back together and the issues I was having with air getting into the outlet seem to be resolved. I would change my rating to a 3 for this pump. Its really only useful for clean, finished beer/liquids. Any small particles getting into the pump can cause it to have issues and will require disassembly and cleaning, which is time consuming and is likely going to happen in the middle of using it to transfer liquids. The inlet side of my pump was missing some threading upon opening. I was unable to thread it properly because of this. I returned it and went with a stainless steel head pump instead. Good transfer pump. No spred control so be careful of oxygenation. Great for transferring into sankey kegs. I got this primarily to transfer beer out of a 55 gallon barrel that my club has into kegs. I first used it to transfer 10 gallons from the Speidel 60L (FE720) fermenter sitting on the ground into a sankey keg and it worked like a charm. Sankey kegs can be a pain to get beer into, but this made it simple. Perhaps the easiest transfer I've ever done. One reason why I love this pump...no priming no priming no priming. Pretty good pump. Used to transfer beer. Doesn't have control for pumping speed so can get oxygen if not careful. I have successfully used this pump for two years and think it is very functional, even though I had to mount it on a board and install an on-off plug and switch for ease of use. During my latest use it became necessary to move the pump a few inches. The hoses were connected and I moved it without disconnecting them. During the move the Upper Housing of the pump snapped off near the hose connection and will need to be replaced. I feel the Upper Housing design should have anticipated such movement and been designed stronger. If you don't use the pre-filter on this pump good luck. I've gone through 2 of these even with the pre-filter. If anything gets into the pump it won't work anymore. ShurFlo beats out March ("The Howler") by a country mile. Two years of beer making and it still operates good as new. March quit after 6 mos. The on-off aspect of the metered pumping is different than the constant flow of March but the end result is the same. This pump is perfect for moving around small (hobbyist) amounts of wine at 3 gal per minute. One observation by another reviewer is that having an on/off switch is very handy as it's moving wine quickly. When you turn it off, it stops immediately and no more wine dribbles out, so its very precise as you fill carboys or barrels. One can pick up an on/off switch that plugs into the wall and has a three prong attachment. They are very handy. I highly recommend purchasing the additional filter. Wine that I thought was very clean had gunk (little wood particles, seeds...) that were caught by the filter before going into the pump. It was a small investment to protect the pump and to insure that no unexpected materials ended up in my wine. It would have been helpful if the pump indicated which nozzel is intake and which outflow. Simple enough to figure out when you turn it on, but they could have had a marking or shown a picture. I have a March 815 built into my plate chiller assembly, and (sorry March), I have NEVER been so frustrated with magnetic impeller pumps! I constant fuss with bleeder valve, liquid in front of and behind pump, but it gives me a constant headache. I often resort to this little 3gpm pump. Without strain, it can move 10 gallons of beer approx. 30 feet even under about 5 feet of head pressure (uphill). I only wish it was made with components able to withstand boiling temps. It would then likely become the only pump I use. What took me sooooooo long!!!!!!! This pump is one of the best purchases I've made ever!!!!! It make the process of transferring from the fermenter to the Corney keg a breeze. No more lifting heavy fermenters or carboys. You need this pump!!!!!!!!!!!! Seriously. 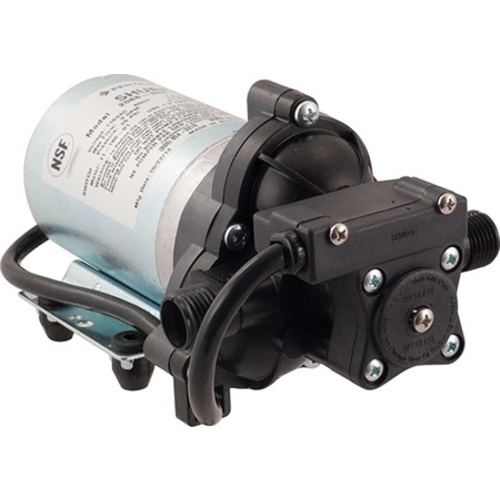 II have been using this pump for 2 years and like it very much. It is easy to use, self-priming and quiet. The only draw back find is that it doesn't have an on/off switch, but I installed one and am happy with. I've had this pump for about 3 years now and it has run perfectly. You can?t use it for hot liquids but it is great for moving everything else. It is also self-priming which is a nice feature and makes it more convenient to use. Also the auto-shut off feature is nice but makes it hard to operate at low flow rates. It really likes to be either all on or all off. If the flow rate is too low it will start to rapidly cycle on and off.